I wasn't really going here but.....I just opened a 2001 Franciscan Merlot by accident (it's a long story) and as always I am stunned by how delightful this stuff really is. Irrespective of price ($14.00 to $25.00), this is truly a benchmark merlot by which all others should be judged. 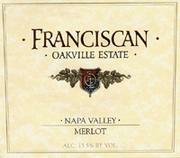 The Franciscan is a rich, full bodied Merlot blended with just a tease of Cabernet Sauvignon. It's not one of those wanna-be, weak-sister (sexist pig that I am) watery Kool Aid-colored red wines that so often pass for Merlot at places where Miles hangs out. Instead you'll find a mellow, velvety-smooth yet complicated wine with luscious blackberry, plum, and black cherry flavors that can easily stand in for Cabernet Sauvignon and often does. Delicate enough to serve with a simple meal of salad and French bread yet hearty enough to compliment prime rib, mesquite smoked pork, or sizzling rib eye. Take the Franciscan with you to an intimate dinner party with good friends. Enjoy it on a warm fall evening outdoors with a fire and someone special. God serves this wine on Sunday evenings so why shouldn't you? BTW, the linked story lists some Merlots that even Miles would drink. Be advised that with the exception of the Duck Horn and possibly the Shaffer, the Franciscan Merlot is THE hands-down wine of choice and, simply put, smokes the rest of that party.